Faced with the prospect of cuts to the Defense Department's budget, the defense industry is pushing the story of the military spending fairy on members of Congress. They are telling them that these cuts will lead to the loss of more than 1 million jobs over the next decade. Believers in the military spending fairy say things like "the government can't create jobs," but also think that military spending creates jobs. Under the military spending fairy story, if the government spends $1 billion dollars paying people to do research or to build items related to the civilian economy it is just a drag on the private economy; however if the same spending goes to military related purposes, then it creates jobs. It's not clear exactly how the military fairy blesses projects to make them helpful to the economy rather than harmful. For example, the highways were built in the 50s ostensibly in part for defense purposes. They made it easier to move troops and military equipment around the country in the event of an attack. Government subsidized student loans were also originally dubbed as defense loans since they were ostensibly intended in part to produce more graduates in science and engineering who could help us compete with the Soviet Union in defense related technologies. Using this same logic, perhaps President Obama could get the military spending fairy to bless some of his stimulus spending so that it will be economically useful. He could again call student loans "defense loans." He could also have the research into clean energy technologies be viewed as providing alternative sources for energy for the military in the event we are cut off from oil imports in a war. (It makes as much sense as the highway story.) Then the military spending fairy can bless the stimulus as creating jobs. For people who don't believe in the military spending fairy, the story is simple. During a downturn where there are lots of unemployed workers, any government spending will create jobs, regardless of whether or not it is on the military. In fact, military spending is likely to create fewer jobs than spending in most other areas (e.g. education, health care, conservation) because it is more capital intensive. 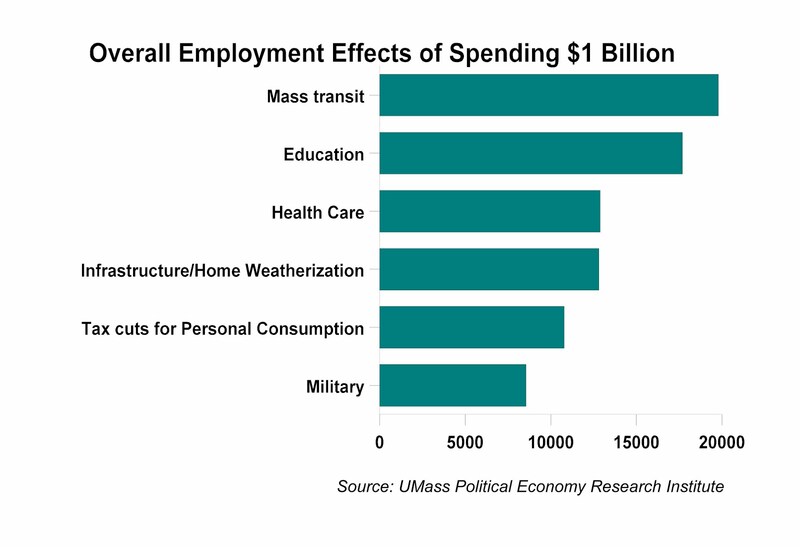 When the economy is near full employment, military spending is a drag on the economy. It pulls resources away from private sector uses, lowering investment and increasing the trade deficit. This leads to job losses, which are likely to be felt most severely in manufacturing and construction. In short, for those who do not believe in the military spending fairy, military spending will cost jobs in either the short-term of long-term. If the spending doesn't make sense in terms of advancing national security, then it doesn't make sense period: end of story.